I’d like to share my manifest obsession with you: my story dress series (nascent, I will admit, but there will be more). Here’s “Story Dress: Fern”. She took 80-100 hours…I lost track. You could wear her inside out, the seams and finishing (which no one will ever see) utterly perfect. As a much younger woman, this level of attention was not appreciated, at least not in my functional work. But scroll forward to present times and it is simply amazing how people stop and inspect and wonder at detail and precision. It was a wonderful turning point in my own appreciation of my skills and what Grandma Eva had taught me. But determined to do the opposite of this time-consuming work, with non-precious materials, and not even “knowing how to draw”, I began tracing cedar roots on white tissue paper, and magical things happened. The very first piece was acknowledged in such a kind way that it catapulted me into the “Tree Bones” series, all measuring about 16” x 22”. But it cries out to grow, and I promise to tackle that. I can imagine an installation with lighting, and pieces even more layered than their present 6 layers of tissue and silkspan. For this week, I chose to play with my age (and see what magic I could work with that!). I used to practice Italic calligraphy, but I’m not at all conversant with painting on fabric or silk, so this was quite the experiment, and my marks are rather crude. 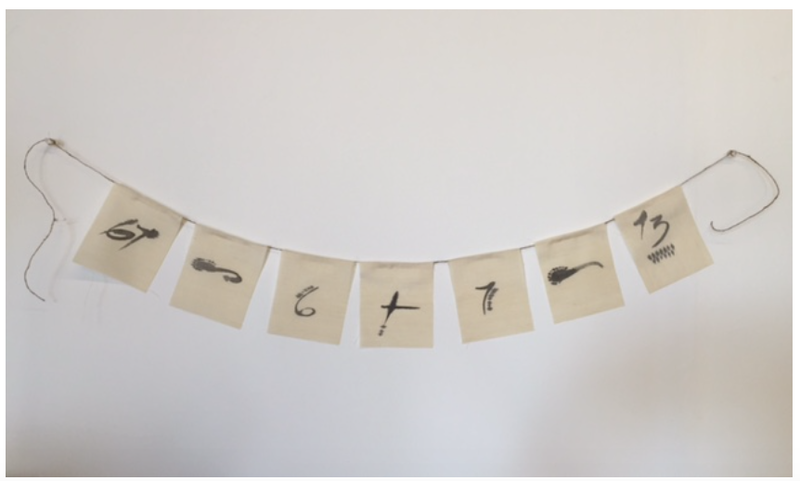 Prayer flags emerged out of playing with numbers. I like my new age. Thanks for a great week of exploration, Jane and all!